Anyone searching for a unique urban electric powered bicycle, may be interested in a unique design which has been launched by the Indiegogo crowdfunding website and designed by Ossian Vogel based in Switzerland. The MOKE electric bike has been designed to provide an affordable high-powered utility bike that is capable of comfortably sitting two people or even one adult and two children. Watch the video below to learn more about the MOKE e-bike which is equipped with 20 inch front and rear comfort tires, a set of 2 carbon-steel disc brakes and an ULTRA long 2-person moped style seat. 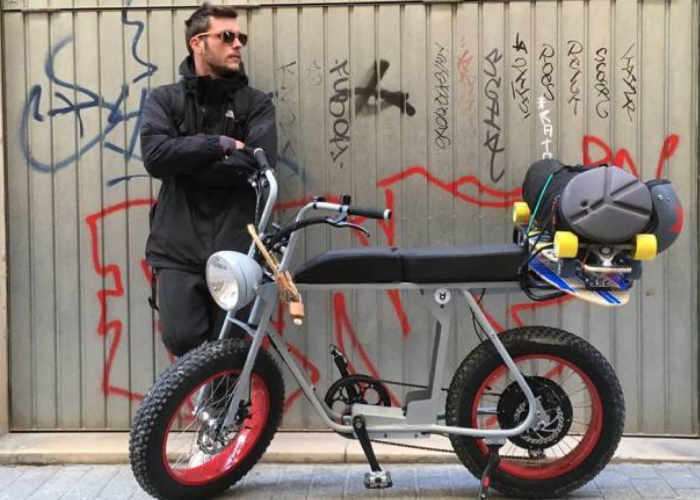 The MOKE was designed by Urban Drivestyle Mallorca SL as a true urban utility vehicle: 180 kg (390 lbs) of useful load, the longest bike seat EVER and a huge selection of cool accessories make the MOKE your personal vehicle for fun, family or work! All of this, paired with high-torque rear drive motors and the best of battery technology, will change the way you drive! Having proven the concept and technology of the MOKE with over 10,000 kms of aggressive testing, rental operations and tours, we now want to get the MOKE into your hands! MOKE has launched via Indiegogo this week and is available to super earlybird backers from $1799 with shipping expected to take place during July 2017.